The 1400E & 1400E2 provide a clean narrow rail appearance along with the endurance and energy efficiency that has come to be expected. Superior product visibility, pre-wired lighting with quick disconnect for easy servicing and interconnecting frame sections that support any size line-up. 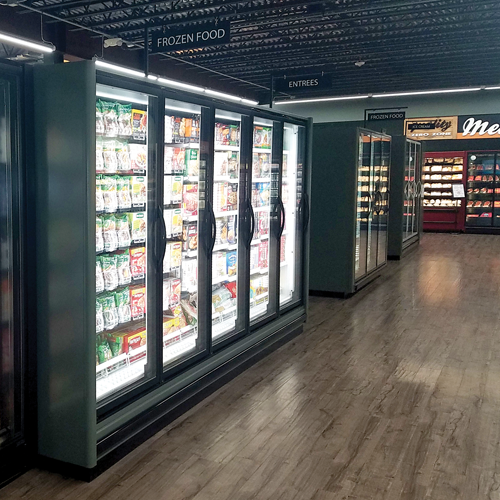 The 1400E and 1400E2 are by far our most popular models, which also offer easy to-install cooler and matching freezer doors and numerous features and benefits that provide long-term performance and effective product merchandising. 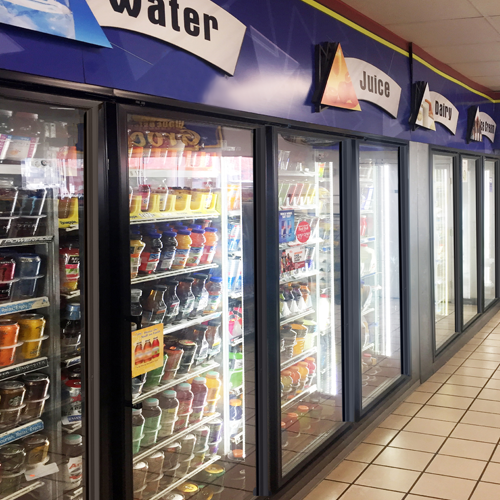 Thermoseal glass doors combine the latest technology, premium materials and design features to meet the demanding requirements of Supermarket / Restaurant / Convenient Store Industries. Leading competitor door replacement – utilizes the same NCO’s, door dimensions & shelving hook points, offering component level and full system replacement compatibility. Standard Shelving – doors less than 79”: Five shelves, shelf depth options include 24”, 27” and 36”. Door width options include 24”, 26”, 28” and 30”. Standard Shelving – doors 79” or taller: Seven shelves, shelf depth options include 24”, 27” and 36”. Door width options include 24”, 26”, 28” and 30”. Double Wide Shelving: Shelf depth options include 27” and 36”. Door width options include 24”, 26”, 28” and 30”. T-8 LED: Mounts in a traditional T-8 socket. Equipped with an integrated power supply and has a very similar appearance to traditional inductive lighting. All sizes have color temperature of 4100K and are all UL & DLC Listed. Lamps come with a full 5-year warranty. Thermoseal’s LED: Designed for the discerning commercial markets with light saturation levels, color temperatures, limited artifacts and optimum efficiency is required. Equipped with a simple quick disconnect power for easy service and replacement. 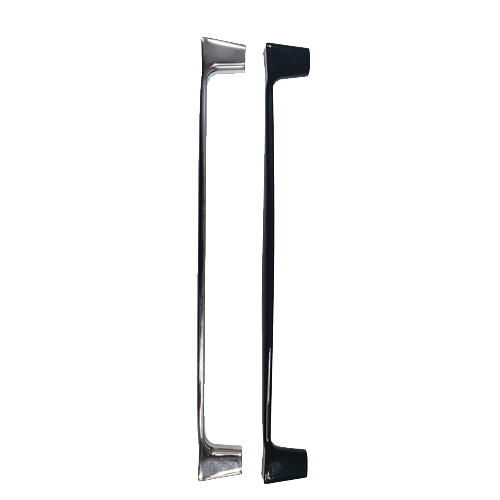 Standard Slimline Handles: The Standard Slimline Handles are available in black and polished silver. 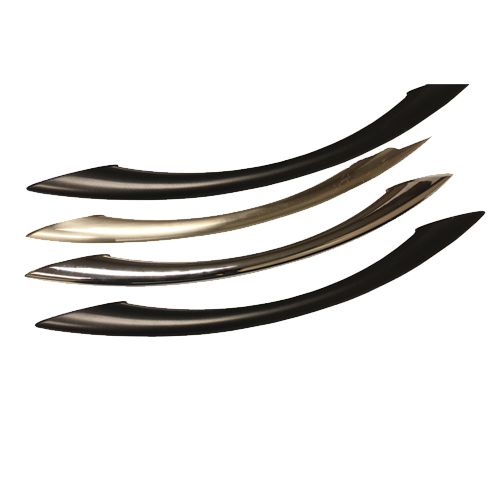 Elliptical Handles: Elliptical handles are available in black, polished silver, nickel, and black anti-microbial. NOTE: Other handles available for replacement to match existing product – contact factory for specifics. Standard Door Rails: Standard door rails are available in Satin Silver and Black. Other rails are available to match existing glass doors – contact factory for information. 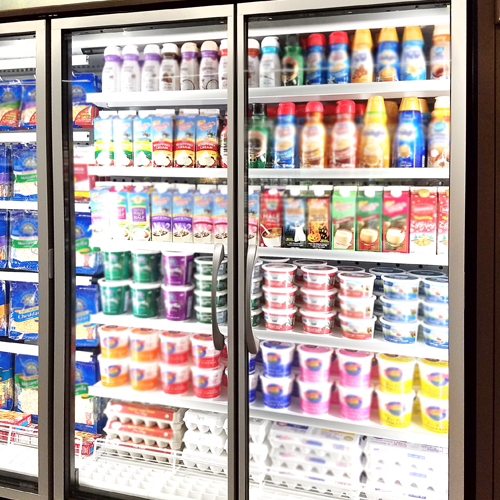 Options: 2 or 3 Pane Heated / Non-Heated Glass, Energy-Free Cooler Door, French Door Frame (cooler applications only), Pass-Thru Door Version, Prostar LED, LED T-8, Full Length Handle, Cylinder or POM Lock, Energy Controller, Extra Shelves, Black / White Epoxy-Coated Shelf Posts, Anti-Fog, Hydraulic Closures (available for Pass-Thru’s, both standard swing & “B” swing varieties).